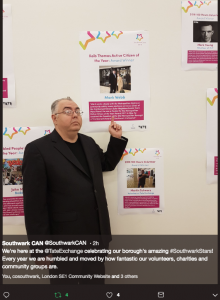 SE5 Forum is pleased to announce that Mark Webb (below), long-term volunteer and Chair of the Camberwell Green Safer Neighbourhoods Team Ward Panel, has won the Keib Thomas Award for Active Citizen of the Year from Community Southwark for his committed voluntary work on community safety, including accompanying the Met Police on local knife sweeps. Earlier this year, Mark raised £328.48 in a donation from The Co-Op in Camberwell towards metal detector equipment for knife sweeps. This was covered in Southwark News. In addition, two of our board members Sophy Tayler and Craig Stansfield have received the 100 Hour volunteering award for their work for SE5 Forum and in particular their efforts towards the campaign to re-open the train station and create better, more sustainable transport links for Camberwell. Many thanks for all their voluntary contributions. Community Southwark’s Southwark Stars gives the opportunity to celebrate those who take the time to volunteer to support others thus helping to make Southwark a better place. In addition to the Southwark Stars Awards event this year, Community Southwark is going to continue the celebration by displaying posters of nominees and winners, and their stories, at the Tate Exchange space for the weekend following the event. The award Ceremony will be held on Friday 16 November at Tate Exchange from 6pm to which successful nominees and a designated number of organisation and family representatives will be invited, too.